병풍처럼 우뚝 솟은 거대한 화강암체로서 모두 6개의 봉우리로 이루어져 있고 정상부에는 항아리 모양의 구멍이 5개가 있어 근경이 훌륭하며, 시각적 풍경뿐만 아니라 예부터 ‘큰 바람 소리가 울린다’는 의미에서 ‘천후산’이라 불리고 있어 청각적 감상도 기대할 수 있는 곳이다. 울산바위는 그 자체로도 명승적 가치를 지니지만 원경도 빼어나 특히 미시령 옛길 방면에서 보이는 경치가 웅장하고 탁월한 느낌을 준다. 울산바위에 대해서는 주세붕, 최연, 허적 등 조선시대의 수많은 문인들이 그 웅장함과 훌륭한 경치를 노래하였다. 울산바위 아래에는 우리나라 불교사에서 유서 깊은 계조암과 신흥사가 있어 문화적 의미가 더하며, 수많은 고시문이 전하며, 김홍도가 그린 실경산수화도 여려 편이 남아있어 미술사적 명승의 가치가 있다. 화강암의 독특한 풍화양상으로 만들어진 기암절벽으로, 많은 사람들이 공감할 수 있는 경이로운 자연경관의 하나이며, 속초를 중심으로 동해안에서 바라보는 울산바위는 그 특유의 기복이 심한 산형이 주변의 다른 산체들과 비교되어 더욱 장엄한 모습을 보여주고 있다. 울산바위는 그 자체가 가지는 명승적 가치와 더불어 빼어난 조망점의 가치를 복합적으로 가지고 있다. 설악산은 한반도 남한 지역에서 나타나는 화강암 지형 중 가장 높은 고도를 보이는 곳으로, 특히 울산바위는 절리를 따른 풍화와 잔류 암체의 지형을 잘 보여준다. 울산바위 아래의 계조암과 흔들바위 등지에서는 미립적인 풍화에 의한 타포니와 토르 같은 아름다운 미지형들도 나타난다. Ulsanbawi Rock is a huge towering granite outcrop consisting of six peaks with five weathering pits at its summit. It is renowned not only for its outstanding scenery, but also for the howling of the wind as it blows between the peaks, so it was once called Cheonhusan, meaning ‘a mountain of the howling sky.’ The distant view of the rock seen from the Old Road of Misiryeong Pass is grand and impressive as well. The rock is also culturally significant as traditional Buddhist temples such as Gyejoam and Sinheungsa are situated in the area around the rock, while plenty of poems and true-view landscape paintings from the Joseon period depict the scenic beauty of the rock and its surroundings. This marvelous geological feature was created by the unique weathering of granite over a long period of time. 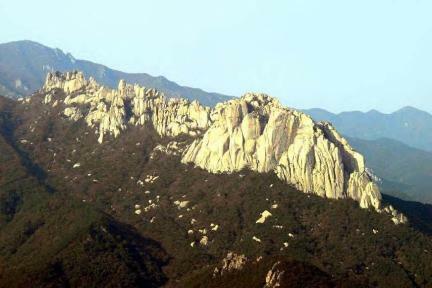 When seen from Sokcho and the east coast of Korea, Ulsanbawi Rock presents a particularly imposing scene compared to other mountainous areas around it.